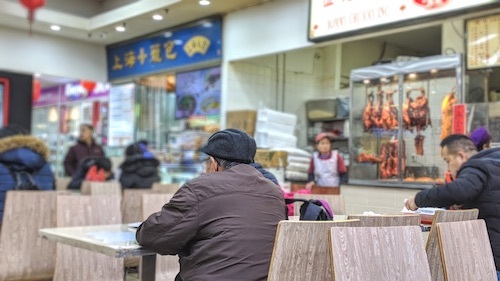 In Chinese, the signs and menu translate to Shanghai Xiaolongbao, which English speakers know as the famous soup dumplings. 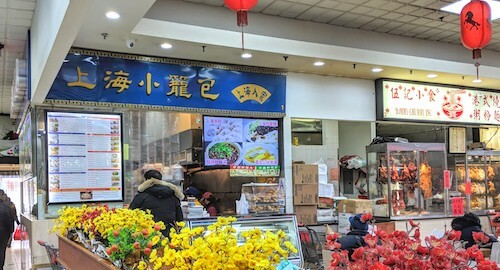 A less imaginative "Guang Fu Inc." is written in English on the menu, but most speakers of that language come here for the dumplings and nothing else. In fact every time I have approached the stall the ladies here say "Soup dumplings!" with certainty and none of the inflexion of a question before I have gotten a word out. But this gives the stand short shrift, they have a long menu and some of the noodles are quite interesting. Stall #1 is selling much more than just xiaolongbao, although they do have bags of those frozen for you to take home as well. Fatty beef & vermicelli with sour & spicy soup ($6.75, above and below) is possibly the most unique standout dish in the food court. This soup is made with potato or yam-based vermicelli noodles and is done in a southern style. All in all, the massive bowl seems like it weights 10kg when it is served. 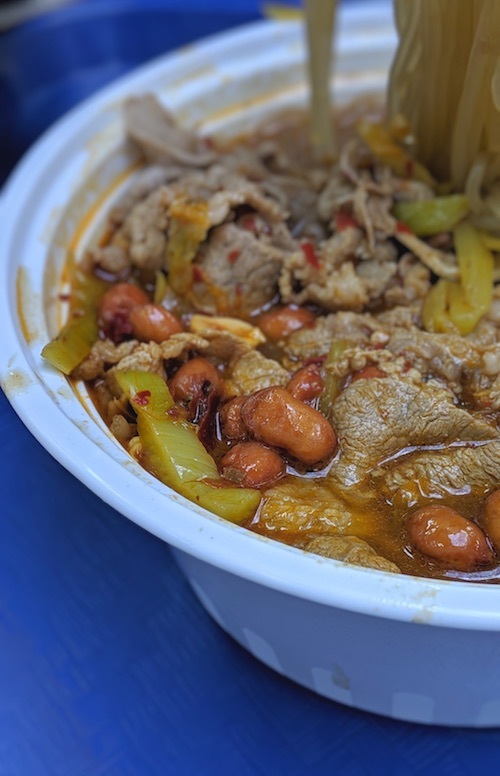 The thinly-sliced fatty beef is visible on top with some of the pickled vegetables and peanuts in a vibrant reddish-brown broth when the dish is served, but lift up some of those noodles and you'll also find bean sprouts, lotus root, cucumbers, mushrooms, and fried tofu underneath. This kind of sour/spicy combination is wonderful, and rounded off well by the sweetness of peanuts. 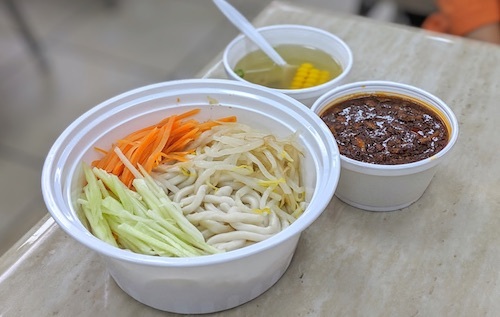 If the hand-pulled flour noodles of more northern regions of China are more your thing, the house special bean paste noodle ($5, below) is also of note. This comes served with a small cup of soup and the bean paste on the side. You can mix in the bean paste at your desired level of saltiness. 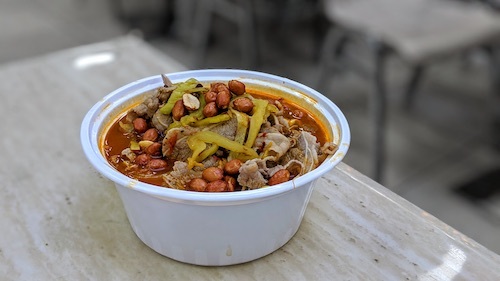 The dish is also available with different meats for a dollar extra, but there is ground pork and fermented tofu in the paste already, so it is not essential to add these even for the vegetable-averse. No matter how much you add, mix the whole thing up well and enjoy the texture of the thick noodles. Such a simple dish but really enjoyable. 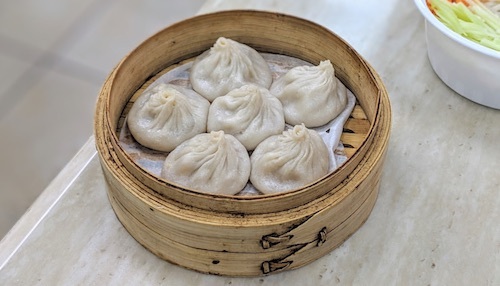 And about those xiaolongbao ($5.50, below), go ahead and get an order of those as well. If you happened to glance in the side window of the restaurant on your way into the food court, it is hard to resist these creations when you see them being made so fresh by a team of stuffers, spinners, and folders. This miniature dumpling factory is still doing good business. The pork versions of the dumplings are full of fresh ginger taste and sometimes even hunks of the root. Sipping out the hot juice makes you appreciate when a place actually takes the time to make these right. It is not the most simple thing to make, and bad versions at dim sum parlors and elsewhere are far too prevalent.